You are here: Home / Saving Money / Personal Finance / What Should I Do With My Tax Refund? Most of us expect a pretty decent tax refund every year. It’s a nice incentive to look forward to after working hard the whole year and staying productive! and the amount you withhold from your earnings throughout the year. No matter the size of your tax refund, Your financial situation can be improved by it. 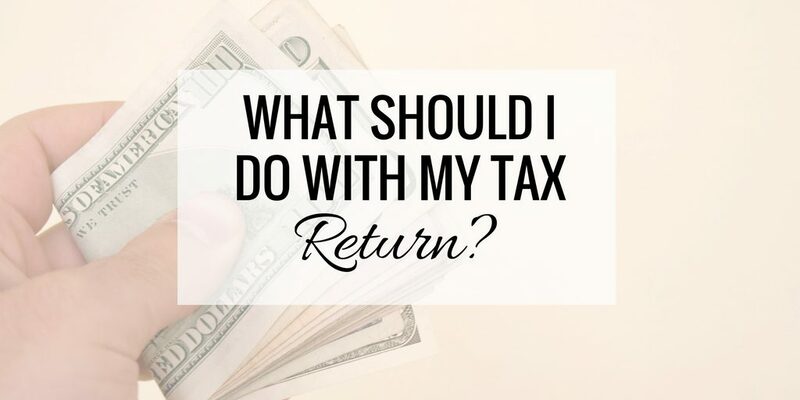 Wrap Up: What Should I Do with my Tax Refund? The urge to splurge is hard to resist for many people when they get their tax refund money. This is especially hard for people who live paycheck-to-paycheck. With that said, let’s talk about some positive ways to use your tax refund. This might not be as fun sounding, but your future self will thank you! How much better is being debt-free instead of wasting it on impulsive purchases. One suggestion offered by a lot of financial advisers is paying down debt such as student loans. I would also add car loans, home equity lines of credit and your mortgage to that list. You can pay off the cards with the highest interest rate. Many people disagree with the “snowball method” because you’ll end up paying more in interest. This is a good point, but when dealing with us humans, you can’t always just look at the numbers. Psychology must be considered, and that’s what the snowball method does. An emergency fund is something a lot of people do not think about. An emergency fund for unexpected emergencies is very important and reduces stress. Wouldn’t it be nice to prepare for things such as an illness or being laid-off from work? You can use your tax refund to start an emergency savings account. This is apart from any existing savings you have, such as your retirement fund. This emergency fund will be your fallback for unplanned expenses. Investments are not always the most popular options for using tax refunds because their benefits are not seen immediately. Retirement plans, mutual funds, and stocks are building blocks for future financial security. They are almost always wiser uses of money, whether it is from tax refunds or not. Investments can also come by way of personal skill upgrades. You can take certification courses or classes at a local college. You can sign up for vocational courses that make you a more productive and qualified professional. By investing wisely, you can multiply your tax refund into something far larger. If all of the other areas of your life are in order, then maybe you need a vacation! A vacation may not be on your priority list, but taking time off might be the best idea. Allowing your body, mind and spirit to recharge is very important to maintaining your well-being. When was the last time you took a vacation? You can use your tax refund to book a getaway for you and your family. Wouldn’t it be nice to head into the remainder of the year refreshed? In this article, we discussed some of the ideas you can use to better use your tax refund. Debt should be the first thing you go after with tax refunds. Next, you should build up your savings. After that, investing and enjoying it are the next best options. You should create a stable financial base for you and your family. After that, build your investments off that stable foundation. This might be in the form of stock investments, or perhaps you can save to start a business! The financial community often looks down on tax refunds because they are an interest-free loan to the government. That doesn’t mean they can’t be used in a very positive way to put you into a better financial situation. If you get a nice, fat check in April, then make sure you spend it as wisely as you can.